Hi all. Holiday time is over so its time to get back to business. During last few weeks ive managed to get back to fantasy side of things and finally do some work on my Vampire Counts army. 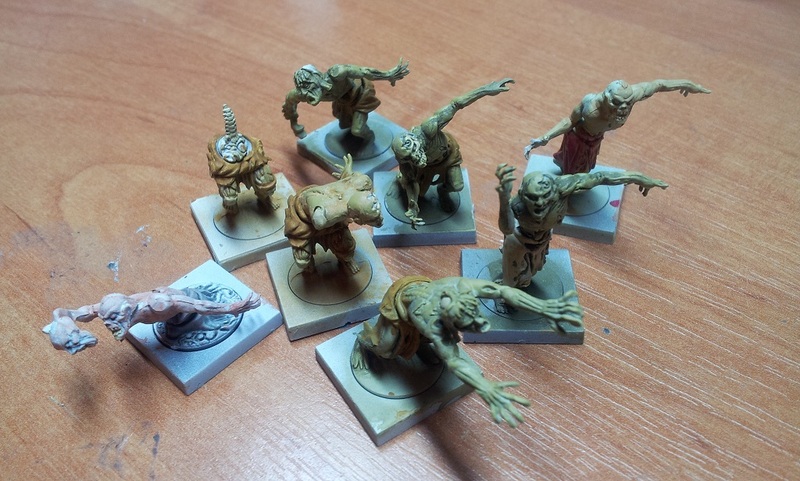 As you probably already guessed one of the units ive spent some time on were zombies! 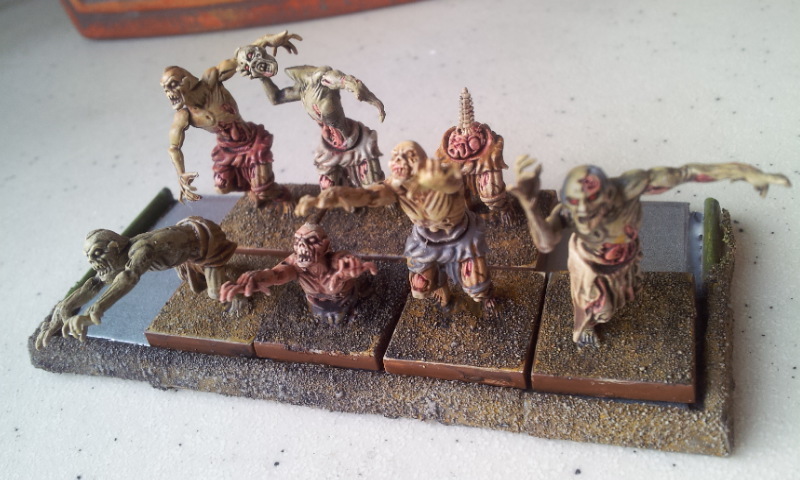 Zombies are a very crucial unit for this army but also a very universal concept that pops up in almost every setting so this tutorial might become useful not only for warhammer vampires players but also for those of you who play 40k nurgle armies, some other fantasy/horror games or just like to run occasiona zombie apocalypse scenarios. 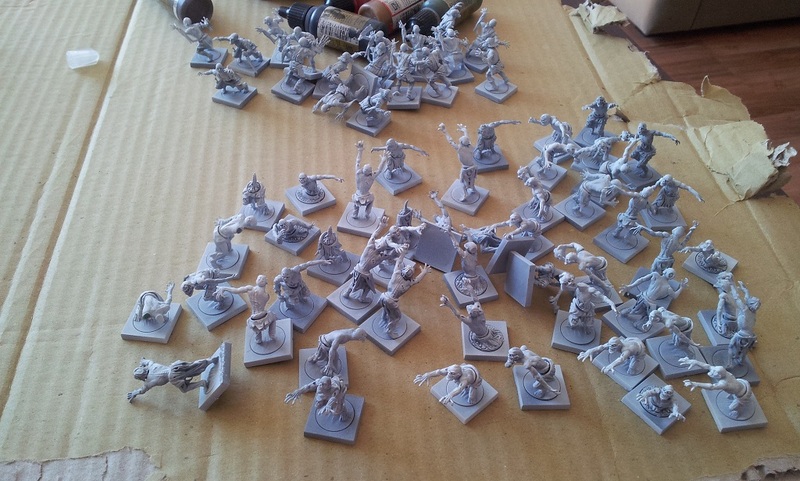 To no surprise zombies come out as a horde so we are talking about painting a lots of models. For my army ive already done 50 of them with 50 more to go so one can look at a lot of painting time to finish such huge mobs. Thats why its important to try to optimize this process as best as possible. With this scale the overal look of the horde is much more important than each indiwidual model so thats also important to keep in mind. 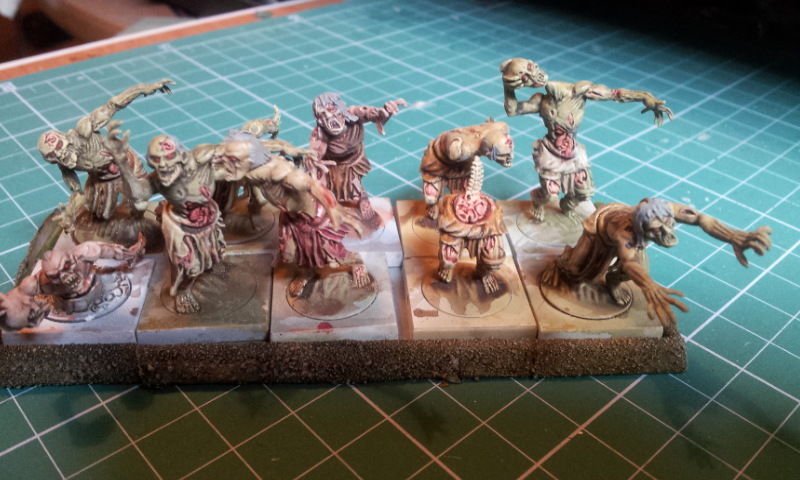 My recipe for this is simple: do a basic color for skin, seperate one for clothing, then use GW brown Agrax earthshade to do its magic, then dry brush whole thing lightly with some bone color, then paint all exposed meat parts with flesh color and apply red ink to them. Finally paint all final details like exposed bones, eyes, hair etc. This last step however can be ommited if you dont feel the need to spend the time on it. Thats it. Few simple steps and its done. If you are still with me then lets take a look at it in more details. Im using the Mantic zombies, because they are looking great in group and are very nicely priced. First of all undercoat. I strongly suggest white over coat for this kind of project as it will work much better with washes and single layer technics. Now for the main layers. This is one of the most important parts, as it will dictate the look of the models. Try to use light tones and apply them in as thin layers as possible. This is where white udercoat come in handy. With thin layers some times the edges on the details will show some undercoat. Thats ok, as it will work well with drybrushing later on. I also suggest to work on groups of figures instead of single ones. I was working on 20-30 models, applying single layer to each one of them before switching the tone or going for next step. Depending on how big is your horde you should get a few different skin tones to add some feel of variety to this ammount of models. I went for some camo green, light brown(almost yellow) and a taned skin color. Basicaly greys, greens and browns works best, but try to use very light colors because they will get a lot darker later on. During this step you can also try to introduce a second layer by applying a different tones to some parts of the models. 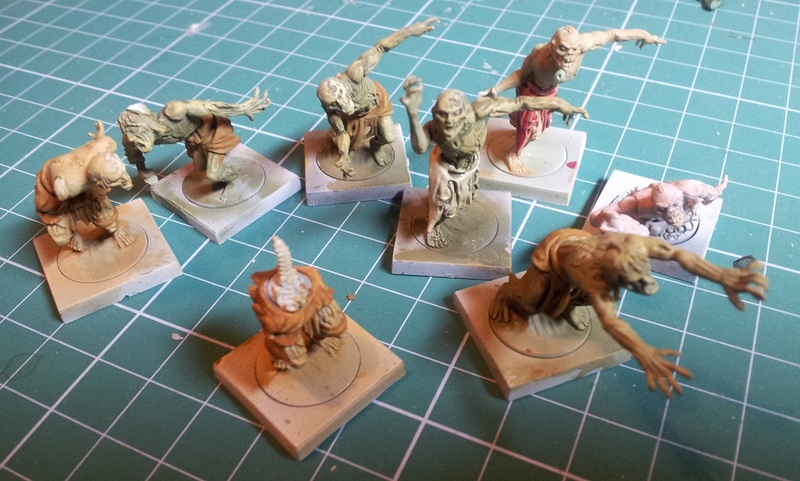 Its worth to try if you are painting a smaller group of models like 10 – 30 since with smaller ammount of models any diversity will be very needed. Finally you should pick a color for the clothing. Once again browns and greys but also you can experiment with reds, whites etc. Just remember to use colors that will not blend too much with the color of the skin. As with the skins ive used 1 color per 20-30 models. Right Now most of the details are hardly visible on the model but this is where the magic starts. Pick some larger brush and apply Agrax shade from GW to the whole model. Looks good? Right now its shining a bit but let it dry, it will become completelly mat. Now for the final step when washes are completelly dry you shoudl drybrush the whole model with a light bone color. Just get some of the paint on your brush and dry it with a piece of cloth or paper towel. When its almost dry do some quick brush-overs over the whole model. It should highlight the edges. Now for some final details. Zombies usually have some exposed meat on them. I like it to stand in contrast to the rest of the model. For this ive painted all such places with a flesh color and the used red shade/ink/wash over it. Rest of the details depends on the models and your willingness to spend time on them. The more models you are painting the simpler you want to keep it but its up to you but remember to keep it simple.